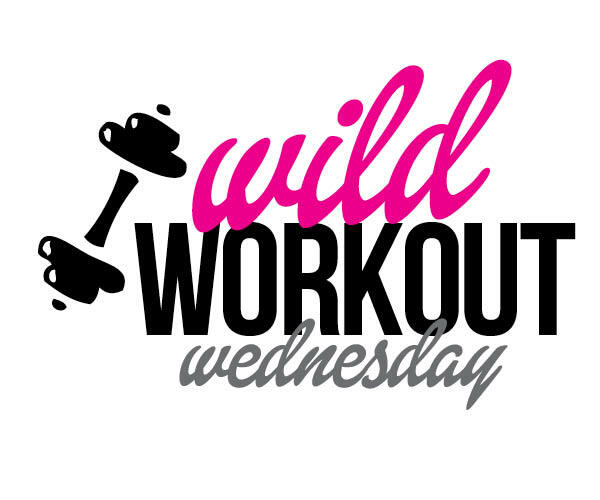 It's Wild Workout Wednesday Link Up time! 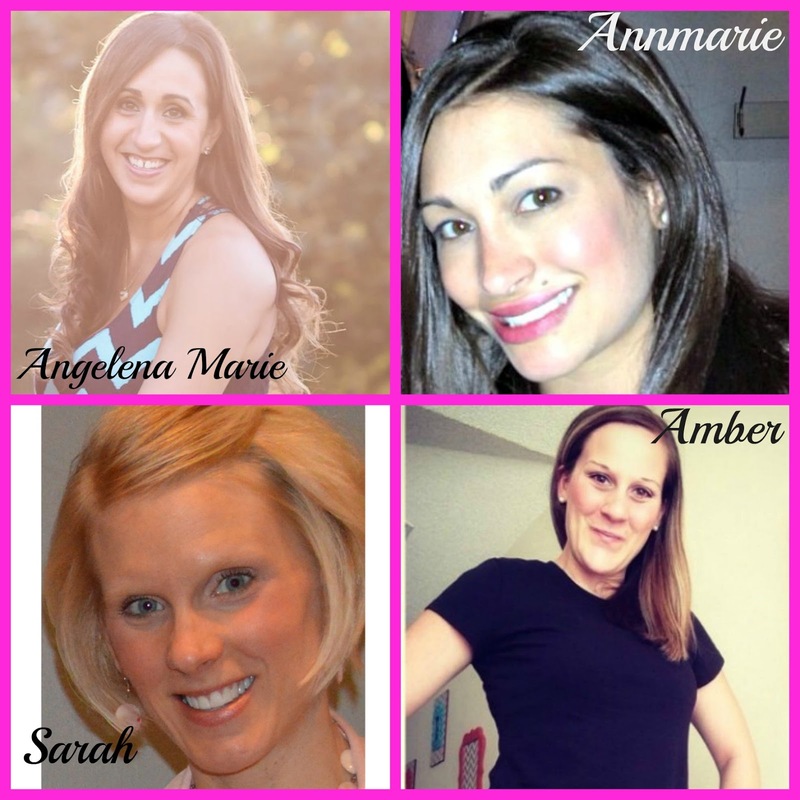 Each week I link up with Annmarie from The Fit Foodie Mama, Amber from Coleman Fitness and Sarah from Creating A Better Tomorrow to bring you guys a fun link up filled with motivation, workouts, recipes and much more. Please feel free to link up and join the party, if you don't have a post to share grab your coffee and get ready for some great blog reading! Sorry I missed you guys last week...if you can believe it I had something else going on with my health, so I was out getting somethings to get my health back on track. I am happy to say that I finally think that I have it figured out. 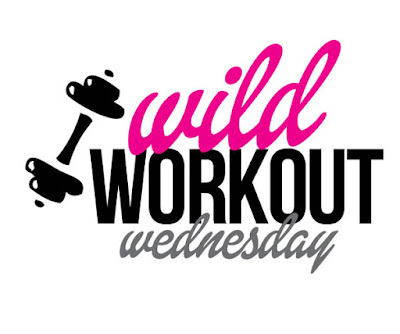 I think, fingers crossed, I will have missed my last Wild Workout Wednesday Link up due to health related issues! As you know I have been getting sick quite a bit this year, bummer I know! I got the flu that was going around in April and since then it has been an uphill battle. I got the flu a second time, then a sinus infection. I felt like a hot mess and was so sick of being sick! 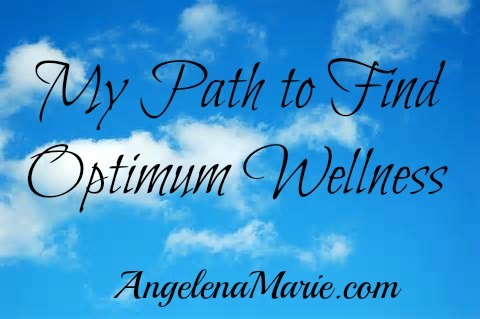 I went to go see a functional medicine doctor, he is an MD, but works with supplements and natural remedies to help get you to your optimum state of wellness. Since I was definitely not in my optimum state of wellness I decided to see what he could help with. The great part is since he is an MD he is covered by my insurance. I went in for an appointment two Friday's ago to get some blood work done and to see what he thought was going on. We sat and talked for a little bit and he asked me a ton of questions, and before we even got to the live blood analysis he had an idea of what was going on. The live blood analysis was really cool, they pricked my finger and then looked at it under a microscope! Right off the bat he said that I had yeast in my blood, which is a sign of candida overgrowth, most likely from the anti-biotics I had to take for the sinus infection. This can also cause a leaky gut, and with that comes inflammation, and then my immune system goes into overdrive because of the invaders of food that is getting out of my gut lining. He also said it looked like I had a little adrenal fatigue. Because of what was going on with my gut coupled with the fact that I haven't been able to lose weight he suggested the Paleo diet to help get my digestion back on track, so I have been back on Paleo since my appointment. He also gave me some supplements, a 4 point salivary test to do at home and send in and I scheduled my follow up appointment. I was feeling great, hoping that once he got all the blood work back he going narrow down as to what was going on. Low and behold Tuesday at 3:00 am I woke up to a raging ear ache and my throat hurt so bad I could barely swallow! I seriously was in denial that I could be getting sick, AGAIN!! I was so close to going to urgent care, but I knew all they could do was give me pain meds and some more anti-biotics and I would be starting from square one. I decided to get some of my essential oils and mix something up to dull the pain so I could get some sleep. My mix of tea tree and frankincense did the trick and I was able to sleep for the rest of the night. In the morning I called my functional doctors office to see if I could get it, I knew it was a long shot as he is booked up months in advance (I happened to get in quickly on a cancellation). However, I told the receptionist what was going on and if he could recommend something to get rid of this naturally, without further damaging my gut I was working hard to repair. A few hours later I heard back and headed in to pick up the supplements and something called liquid silver to help with what was going on. I have been diligent about my eating, getting right back on Paleo, since I have done it before I knew what to do, cut out sugar, added some low impact days to my workout week including walking and yoga, have been taking my supplements regularly, drinking at least 2 liters of water daily, and have been getting 7-8 hours of sleep each night. I am so happy to say that my ear cleared up and my throat no longer hurts at all. I am feeling so much better, from a combination of eating Paleo and the supplements. My digestion has improved, my skin looks really healthy, my energy is soaring, I am sleeping great and waking up feeling rested. I go back in a few weeks for the results of my blood work and I can't wait to see what he says, I will be sure to keep you updated! I also can't wait for another live blood analysis to see if any of the yeast has cleared up. I know that I am finally on my path to optimum wellness. I will again feel healthy, like I usually do! It has been an unusual year for me, and it all started with the flu I got in the beginning of April. If you have been getting sick a lot like I had been, I suggest that you find someone like the functional doctor that I saw, he is working with my body to get me back to my happy, healthy self! I have still been getting my workouts in, and like I said I added walking and yoga into the mix for some lower impact activity. 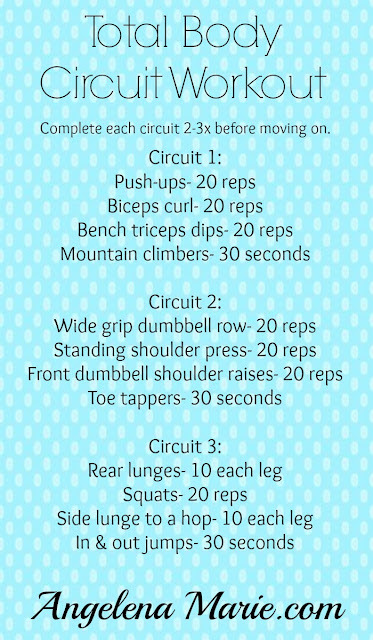 I am taking it a little easy with the HIIT, for now, until I am sure that my immune system is back up to par! 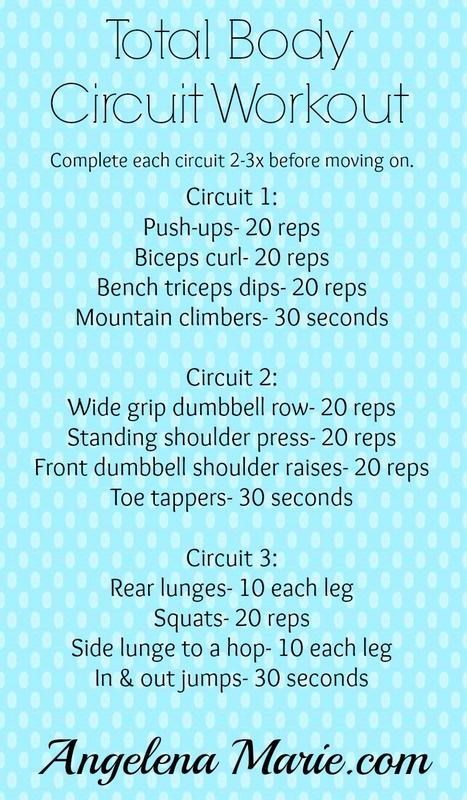 However I am still getting my lifting in, and I love to do circuits. 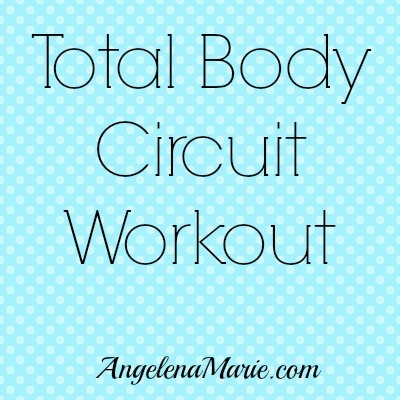 Here is one of my favorite total body circuit workouts. Remember, I am a personal trainer, but not your personal trainer. Please consult with your physician before starting any new exercise regime. Now it's time to link up! Be sure to link back to your hostesses and follow in any way you can. Thanks for stopping by today! Have a wonderfully fit and happy day!